Catching up with something we had not heard about before. 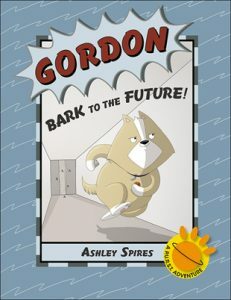 Kids Can Press describe Gordon: Bark To The Future like this: “It’s all up to Gordon now. His partner has been captured. His superior officer has been neutralized. And his distress calls to P.U.R.S.T. (Pets of the Universe Ready for Space Travel) have gone unanswered. That means he must fight the aliens alone! But Gordon’s not a fighter — his deadliest weapon is his mind. So what’s a genius dog to do? Time travel, of course!” The publisher goes on to say, “This laugh-out-loud junior graphic novel is part of Ashley Spires’s hugely popular P.U.R.S.T. Adventure series. Gordon the dog is a favorite character from Spires’s companion series about Binky the cat.” Got all that? Good! Okay, follow us here — this has several layers. Stacy Hinojosa is a well-known YouTube personality who has created a popular series of fantasy Minecraft videos called “Dogcraft”, under the name Stacy Plays. 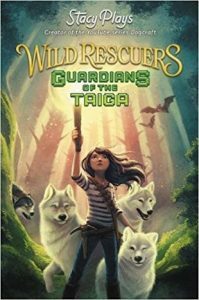 Well now, under that same name, she has spun off one of those Minecraft stories into a new fantasy book series, Wild Rescuers, written under the same name. The first book in the series, Guardians of the Taiga, goes like this: “Stacy was raised by wolves. She’s never needed humans to survive and, from what she sees of humans, they’re dangerous and unpredictable. For as long as she can remember, Stacy’s pack of six powerful, playful wolves — Addison, Basil, Everest, Noah, Tucker and Wink — have been her only family. Together, Stacy’s pack patrols the forest to keep other animals safe, relying on her wits and each wolf’s unique abilities to accomplish risky rescue missions. But as the forest changes and new dangers begin lurking, are Stacy and the wolves prepared for the perils that await them?” The book is available in hardcover now. 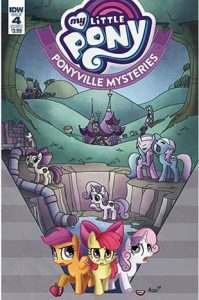 Harper Collins has more information, as well as an interview video with the author. Kung Fu Fighting. Well, Not Exactly. Somehow we missed this when it came around last year. Team Taekwondo is a black & white graphic novel series for younger readers, published by Rodale Kids. The first volume is called Ara’s Rocky Road to White Belt. It goes like this: “Ara is the odd turtle out in his family, preferring his rock collection to new or wild adventures—until he meets Baeoh, a confident tiger who practices martial arts. 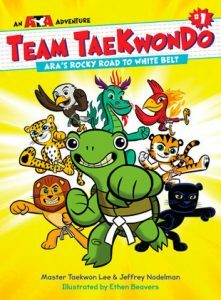 Unsure if he has what it takes to join Baeoh’s taekwondo team, Ara must learn how to come out of his shell, persist through failure, and accept the help of his new friends to complete the Tiger Fitness Challenge.” They go on further to say, “The Team Taekwondo series combines the appeal of graphic novels and martial arts to deliver action-filled, character-building stories. Each book also includes one free lesson at any participating licensed ATA Martial Arts location.” Each book in the series is written by Master Taekwon Lee and Jeffrey Nodelman, and illustrated by Ethen Beavers. Now the second volume, Baeoh and the Bully, was just released to stores as well. With a name like Taco, this rodent is gonna be different… maybe even difficult. “This is a squirrel . . . ‘Hey, I may be a squirrel, but my name is Taco! And I don’t eat nuts and tree bark — blech — I prefer tacos!’ The natural predator of squirrels is . . . ‘Whoa, whoa, whoa! Who is writing this book? 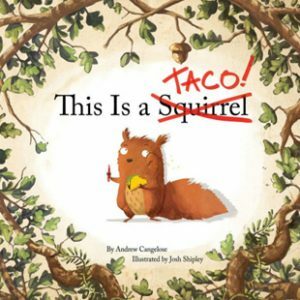 I do not like where this is going.’ This hilarious send-up of a children’s nature primer teaches kids that the most important story is the one you write yourself.” This Is A Taco was written by Andrew Cangelose and illustrated by Josh Shipley. It’s available now from the Cubhouse imprint of Lion Forge. Check it out at Barnes & Noble. 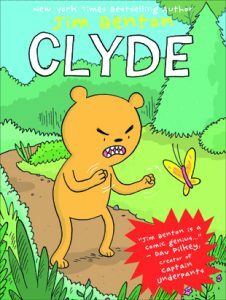 Now there’s a new full-color graphic novel for young readers, written and illustrated by Graham Annable (director of The Box Trolls). 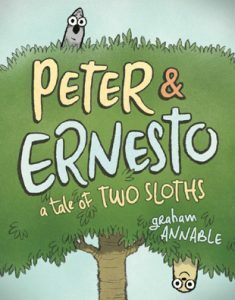 Peter & Ernesto: A Tale Of Two Sloths — pretty straightforward, yes? “Peter and Ernesto are sloths. Peter and Ernesto are friends. But Peter and Ernesto are nothing alike. Peter loves their tree and never wants to leave, while Ernesto loves the sky and wants to see it from every place on Earth. When Ernesto leaves to have a grand adventure, Peter stays behind and frets. The two friends grow even closer in separation, as Peter the homebody expands his horizons and Ernesto the wanderer learns the value of home.” It’s available now from First Second. Well here’s something different: Mythical Creatures is a full-color one-shot comic from Arcana Studios, written by Mark Poulton and Sean O’Reilly and illustrated by Munro Te Whata. “Eru lives for video games, but after an argument with his mother, he sets out on a real life adventure. 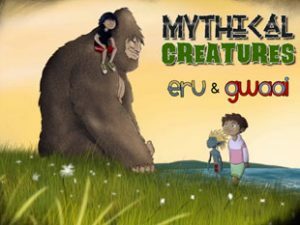 Getting lost in the Canadian wilderness, Eru befriends Gwaii and a Patupaiarehe, who help him track down the mystical Raven to get back home. During their journey, they encounter some creatures from the rich mythology of Canada and New Zealand. Based on the upcoming animated pilot from Arcana Studio and Kiwa Digital.” Sounds like something we’d like to know more about! And oo, look: Here’s a video preview too. And look: Here’s a whole new series of novels for young readers by Bruce Hale. 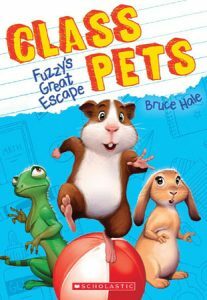 The first book in the Class Pets series is called Fuzzy’s Great Escape. “Fuzzy is the ambitious and unfortunately named guinea pig of class 5B. He has big plans for this year — namely, to be president of the Class Pets Club. Then the cutest, most charming new bunny shows up and spins Fuzzy’s plan like a hamster wheel. There’s only one way to topple the adorable new club president: Fuzzy is taking the pets on a field trip!” Follow up that fun with Fuzzy Takes Charge and Fuzzy Freaks Out. All of them are available now from Scholastic Press.